Audioboom / This was an outdoor interactive art event in Deptford. SERFs Art Collective are exploring how we can use the notion of social networks, face to face relationships and informal exchange, as well as on line connections. 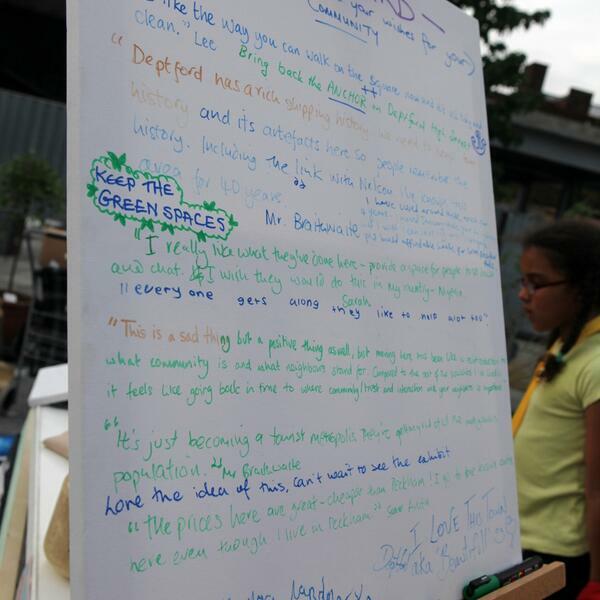 This was an outdoor interactive art event in Deptford. SERFs Art Collective are exploring how we can use the notion of social networks, face to face relationships and informal exchange, as well as on line connections. Using Photography, Recording and Art, SERFs art collective decided to explore relationships and also on line relationships. By using interactive devices, such as web cameras, microphones and speakers, actual talking and seeing becomes possible through the internet. Deeper intimacies like serious relationships or marriage are also feasible for many internet couples. BUT HOW? Perhaps this is called building up !!! Using technology we can see each other's faces and emotions on line too. But still this relation needs building up-following up... just the same as when we catch up face to face The .only thing missing is physical contact but perhaps that will come too...would that scare you? This is a feature capturing the voices and thoughts of people living or coming into the Deptford, in the borough of Lewisham.